I don’t know if you’ve heard of Posh Tattoos but I had seen them around the blogging community and was totally thrilled to try them out! Keep on scrolling to see more photos of some of them and also to find out more on what I think about these temporary tattoos! Remember the fun times as a kid when you would stick your whole body with temporary tattoos, feeling super badass? Well, now as a grown up you have a great alternative that looks super stylish and fancy! 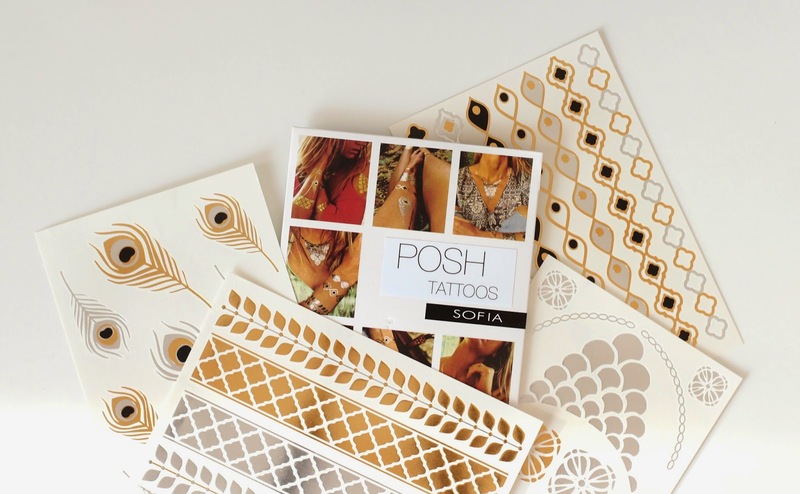 Posh Tattoos is a Swedish company that produces and distributes temporary tattoos but not any regular ones: they’re golden and silver! What I loved most is that they look awesome on tanned skin! I can’t wait for the summer to come so I can get to wear these awesome glittery pieces! They’re a great replacement of jewellery and in my opinion, look even better on than any necklace or bracelet would! You can choose between a variety of designs (I got the Sofia), all of which have super intense and long lasting colours! As for how long the tattoos last: depends on where on your body you put them. So if you, for instance, stick them on your hands due to the regular exposure they’re gonna stay put for about two days. In my case, the one on my finger was the first one to go (2 days), then the feather on my hand lasted for around 4 days and the bracelet stayed for 5, even though I showered quite often. So they’re definitely gonna be great for the summer, especially on the beach! The other designs that I would love to try out would be the geometric Lena and the Wild child, both sets look super awesome! For more info, orders and inspiration, you can check out the brand’s website here as well as their Instagram account here. Enjoy! These would be great for the beach, I can't believe they lasted during a shower. What a great idea – I love the bracelet design. Beautiful, seen so many of these recently. I think it's such a fun way to (temporary) spice up your life! I love these tattoos! They are so cool! It's really cool for summer. The feather is so pretty! Изглеждат страхотно :)) Може ли да те попитам от къде се сдоби с тях? These tattoos just look so good!